In between the movies we know that are coming (the Aliens, the superheroes etc.) arrives a certified misfit, a narrative of such beguiling strangeness that it begs to be appreciated. Camus finds COLOSSAL simply amazing. "There's a big chunk of me in her. This is my spirit's monster.'" Movies that are certifiably insane belong to a rarefied genre. I'm not even sure the genre has a name; 'surreal' as an artistic expression of the unconscious may be a label that comes close. The film cited most in Colossal's subtle but entrancing pre-release hype is Being John Malkovich, a comparison that makes very little sense to me. 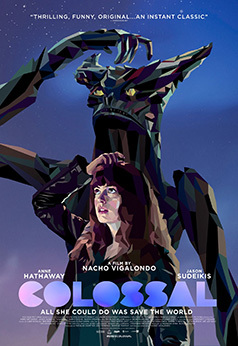 I can think of no film that is anywhere near to being the most distant cousin to Colossal and isn't that a good thing? At a stretch you might call it a hipster's Avatar but that's at Armstrong levels of stretch. These films, despite their own robust internal logic, gleefully eschew reality and believability. The film is linear and easy to follow because at its core it's a 'boy re-meets girl' tale with added monster and robot. Those unique movies in the sparsely populated genre of 'surreal' assert an ownership of a premise, either allegorical or metaphorical, and run with it regardless what the audience expects or needs to fully embrace the concept. This movie has the oddest central premise and expects us to accept it without question, which is about the bravest leap of faith I've seen a filmmaker make in many years or at least since Clarence the angel makes a splash in It's A Wonderful Life. It reminds me of a smart and funny guy who once gave his movie and TV show a ridiculous title as a way to weed out those who'd turn their noses up at something rather wonderful but with such a outlandish name. But Buffy The Vampire Slayer didn't turn out too badly for him. At all. Director Vigalondo and his brave investors must have known going in that just because you have an A-list star in the lead, it doesn't mean a guaranteed successful opening weekend or a successful run in theatres for that matter. I suggest hand on heart, that when the big reveal happens, to just accept it. It's like Channel 4's Misfits. There's a lightning strike and suddenly a group of random young offenders are mysteriously endowed with a variety of special powers. No explanation. The core of the entertainment was the characters dealing with the situation not why the situation happened in the first place, nor the enticing promise of a satisfying reason for their super power's origin. It's the same with Colossal including the shared lightning strike catalyst as bizarre a coincidence as that is. What keeps us glued are the performances specifically Hathaway's and Sudeikis's. If you really have a mind that wants or needs to ask why drunk, ex-writer, dumped girl Gloria has a physical affinity with a large monster wrecking buildings Kaiju style in Seoul (why Seoul exactly?) 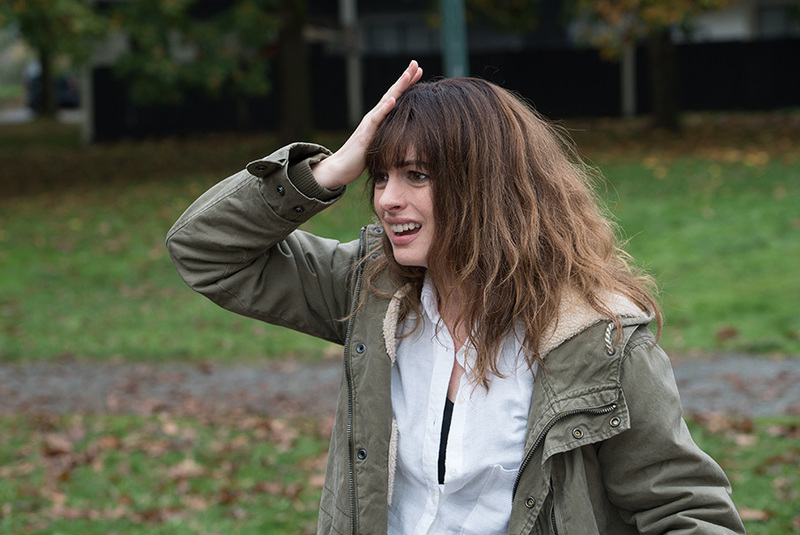 then maybe Colossal is not only not your cup of tea but hemlock for the staunchly unadventurous. And it's not a silly, badly executed 'man-in-a-suit' monster either but a superbly rendered CGI creature that could stand shoulder to shoulder with those from $200 million movies. Now I dare say that those more conservative filmgoers (if you are one, I'm surprised you're here at Outsider but we're still happy to have you), you may not even have got to the end of this sentence which has the memory of holding a lover's hand in front of an open fire in a pub the size of a phone box. Did you make it? Want to go on? Want to know more? Is this Starship Troopers? No, it's Colossal and it deserves our time and appreciation. Anne Hathaway, the once inexplicably net-reviled actress who couldn't play ugly duckling even with a Rob Bottin makeover, plays Gloria, a booze sodden unemployed writer. On a downward spiral, she talks the torque, the pathetic excuses of the memory deficient booze-hound. Her live-in boyfriend dumps her which to be honest seems like reasonable behaviour even if it was Anne Hathaway… But then relationships are complex beasts and beautiful people have as many hang ups as anyone else. Why she drinks is never addressed and trust me, that's not an issue. I have no idea why I drink either except for the obvious high. She moves back to her parents' rather bleak, unfurnished home in the middle of the country while they are away. It's never really explained if they are simply away, why their house is devoid of furniture. There are bigger things coming to swallow whole so mustn't start nit-picking too early. Gloria is utterly incapable of taking care of herself but while on the road she meets Oscar, an old school friend who is the proverbial nice guy. I wouldn't trust that blithe characterisation one bit. He helps her with getting a TV (for some reason the size of a wardrobe), a job (at his self-owned local bar) and who slyly starts to draw his plans to snare her. Now for my money, the only fictional drunk who worked at a bar successfully was Cheers' Sam Malone. If I remember the pilot, he said that he had a problem with his arm… "I bent it too much." Put Gloria in a bar and watch her take the easy slope of slippery and before long she's as sozzled and as screwed up and malfunctioning as she was with boyfriend Tim in New York. But something, something utterly extraordinary, happens to alter her perception of her own irresponsible behaviour. Here's the part of the movie that will have half its audience go "WTF?" and stay with it and the other half go "WTF?" and exit stage left. You have to buy the oddest movie connection or this startling film about gender politics and man and girl power will leave you gaping like a stranded fish. I gaped, I said "WTF?" and then said "Hell, go, Nacho. Let's see what you've got." Gloria hears of a monster in Seoul and is, like the rest of the world, horrified at its destructive behaviour. But a little later she realises that the creature is her booze-sodden id, her inebriated antics at a children's playground faithfully carried out, scaled up horribly by her giant avatar crushing buildings and killing hundreds in south Korea. Her boozing is brick-walled by her profound remorse. She shows her new group of friends just how her connection to the creature works (see the poster) and despite this being the part of the movie where as an audience member you are saying "You've got to believe her!" while thinking "this is the silliest thing I've seen in a long time but still…" it works. I have no idea how, but it does. And then the allegorical or metaphorical silliness places all its modest chips on a single roulette number. Who knew? We have a winner. As Oscar steps into the playground, he manifests himself as a giant robot in Seoul. Whatever did the Koreans do to deserve this? The battle of the sexes has never been so monstrous or robotic. Technically the movie is a mini, low budget marvel. Keeping up with the flawless effects work and the two strongest central performances are the supporting players, Dan Stevens, Austin Stowell and the always entertaining Tim Blake Nelson playing touchingly hurt by Sudekis's over spilling nastiness. Bear McCreary's dense symphonic score is surprisingly lush and eerily emotionally effective. Eric Kress's cinematography is cool and sympathetic to the human players. He has an eye for the epic too while editors Ben Baudhuin and Luke Doolan keep everything on track. I was going to say that given its odd but winning premise, there are no real technical fireworks nor should there be. But there is one literal one in the movie. The crew and the post-production teams keep things as real as they can given the tale being told. I have a soft spot for movies that present the fantastical in grounded ways so in the case of Colossal, that soft spot is practically liquid. To say too much more may rob you of this film's unique pleasures. 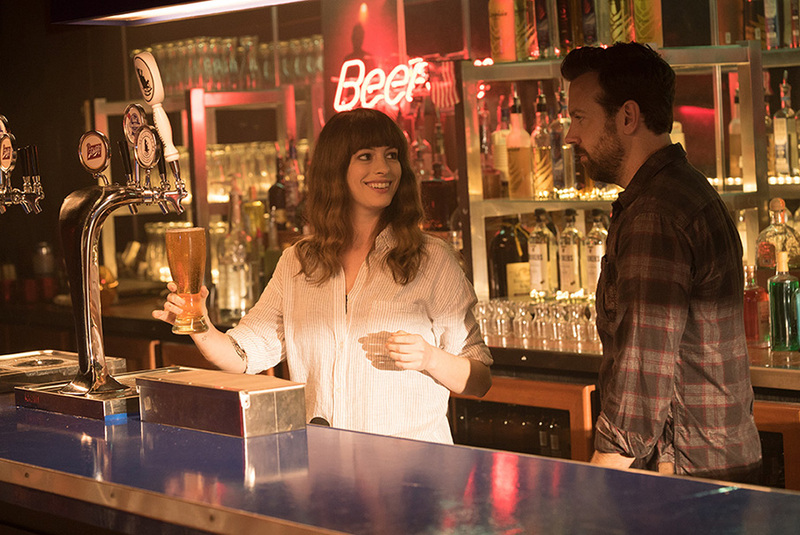 So if you are cinematically adventurous, give Colossal a go on the big screen. By the time this review is up, this niche art movie, albeit Hathaway'ed, may be drifting out of the multiplexes and heading towards its disc incarnation. Don't let its idiosyncratic nature put you off. This is an engaging and entertaining boy meets girl tale and all the monstrous horror that this potential union can entail. Bravo to all concerned.